“Persuading Senior Management with Effective, Evaluated Security Metrics” is the culmination of a multi-year research project funded by the ASIS Foundation. The report provides a tool that will help security professionals evaluate and improve their metrics and use them to demonstrate return on investment as well as alignment with organizational goals. Finally, we have scientifically based information and a validation method that are applicable to the entire field and makes a significant addition to the security body of knowledge. A major metrics research report and security metrics tool was released this month by the ASIS Foundation, filling a crucial gap in the profession and providing security practitioners with powerful resources to measure and demonstrate the value of the security function. The full report is available now for free download. Printed copies may be purchased online through the ASIS Store and a Kindle version will be available in the near future. 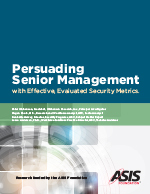 “Persuading Senior Management with Effective, Evaluated Security Metrics” is the culmination of a multi-year research project funded by the ASIS Foundation following work done by the ASIS Defense and Intelligence Council. The main purpose of the project was to develop a tool that will help security professionals evaluate and improve their metrics and use them to demonstrate return on investment as well as alignment with organizational goals. According to the Executive Summary in the report, without compelling metrics, security professionals and their budgets are left to the intuition of company executives. “With metrics, the security function grounds itself on measurable results that correlate with investment, and the security professional can speak to leadership in a familiar business language,” the report notes. “This is ground-breaking research for the security profession,” said Dr. Linda Florence, PhD, CPP, president of the ASIS Foundation Board of Trustees. “Finally, we have scientifically based information and a validation method that are applicable to the entire field and makes a significant addition to the security body of knowledge,” she added. The ASIS Foundation awarded a grant in spring 2013 to Global Skills X-change (GSX), partnered with Ohlhausen Research, to carry out the project. The research project produced a database of selected security metrics and guidelines for effective use of security metrics to inform and persuade senior management. The research project and the new metrics tool will be reviewed at an education session, “Security Metrics: Leveraging Performance Measures to Gain Efficiencies and Demonstrate Return on Investment,” on Tuesday 30 September as part of the ASIS International 60th Annual Seminar and Exhibits (ASIS 2014) at the Georgia World Congress Center in Atlanta, Ga., to be held 29 September-02 October. Download the report from http://www.asisfoundation.org/secbiz. The ASIS Foundation is a 501(c)(3) nonprofit organization dedicated to providing high-quality and contemporary research and education opportunities that serve to enhance the security profession. Through the awarding of scholarships, the Foundation ensures that those pursuing a career in the field of security management are able to realize the highest academic achievements. Foundation programs are supported solely by contributions from individuals, ASIS chapters, and other organizations who share its vision of advancing both the security profession and the professional.